With teams closely packed together in the 2016 DVOA ratings, it doesn't take a lot of change to produce a new No. 1 team. The Dallas Cowboys move ahead of the New England Patriots and into the top spot, as their win over Tampa Bay had a slightly higher rating than New England's win over Denver. The two teams were separated by less than 0.5% last week and they are separated by less than 0.5% this week, but the Cowboys are in the lead. This is the first time the Dallas Cowboys have ranked No. 1 in DVOA since Week 5 of the 1997 season. However, the more interesting story here might be the team that moves into the top spot in weighted DVOA this week: the Pittsburgh Steelers. The Steelers are simultaneously the most inconsistent team in the league this year (26.2% variance) and the most balanced team in the league this year (the only team in the top ten on both offense and defense, with above-average special teams as well). The Steelers are only one-tenth of one percent ahead of New England in weighted DVOA, and their rise to No. 1 in weighted DVOA is a bit of a fluke having to do with the way the weights for different weeks work. There's a big drop in the strength of games more than 12 weeks old, which means that Pittsburgh's 34-3 shellacking at the hands of the Philadelphia Eagles became a lot less important in the rating this week. Usually, this effect is negligible; only a handful of games each year are as bad as that Steelers game, and usually those teams are bad most other weeks as well. The Steelers are an exception -- not only because they've been so much better since that game, but because they went out just one week later and had one of the best games of the season by any team, beating Kansas City 43-14. 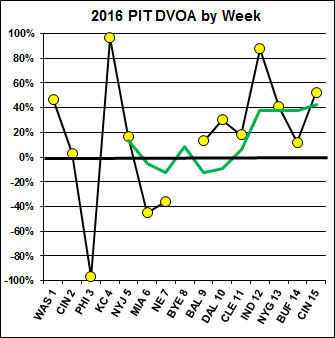 That means that Pittsburgh's weighted DVOA is going to drop next week when the Kansas City game drops significantly in strength. Again, this effect is usually negligible because it is not common for a team to follow up a game below -90% DVOA with a game above 90% DVOA. Then again, the Steelers' No. 1 rank in weighted DVOA isn't that much of a fluke considering that they also rank No. 3 in full-season DVOA. 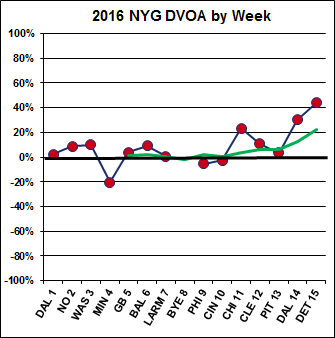 But their inconsistency does give me a chance to bring out the colored week-to-week DVOA graphs for the first time this season. Ben Roethlisberger's inconsistency has been a big story (9.0% variance on offense) but the defense has also been hugely inconsistent (8.9%, the most inconsistent defense). The Steelers are far from the most inconsistent team in DVOA history, but 2016 has brought us the opposite, as the New York Giants may end up as the most consistent team in DVOA history. Right now, the Giants have a 2.5% variance. The record belongs to the 1990 Los Angeles Raiders at 3.3%, followed by the 2013 New England Patriots at 4.5%. Check out the Giants' week-to-week graph compared to the Steelers. What the two teams have in common is that they are playing their best football right now. The Giants have had their four best single-game DVOA ratings of the year over the last five weeks. The Steelers have had three of their top five games of the season over the last four weeks. Nearly every team between the Steelers at No. 3 and the Giants at No. 11 saw its DVOA rating drop a little bit this week. Those kings of close losses, the Philadelphia Eagles, went back up a spot to fifth, but only because Kansas City's rating fell more than Philadelphia's. (You can read more about Kansas City's fall and running game problems in this week's Any Given Sunday.) The Eagles have also fallen to 14th in weighted DVOA, in part for the same reason Pittsburgh is now No. 1. Atlanta, Green Bay, and Oakland all went down a little bit despite winning their games this week. Seattle stayed roughly the same but went up a spot to No. 9. I've written a lot about the Year of No Great Teams, but it is certainly not a year of no great players. However, some of the greatness isn't quite as obvious because it comes on special teams. Vincent Verhei put a spotlight on Johnny Hekker in Quick Reads a couple weeks ago, but it's worth acknowledging the historic seasons that both Hekker and Justin Tucker are having in 2016. Both players are on pace to set records, as the most valuable punter and placekicker since Football Outsiders stats begin in 1989. Let's start with Hekker. Based on our current baselines, Johnny Hekker's punts for the Los Angeles Rams have been worth an estimated 26.3 points worth of field position compared to what we would expect from an average punter who punted from the same locations all year, adjusted for weather and altitude. That's more than double any other punter in the league; Sam Martin of the Lions is No. 2 at 11.0 points. Right now, the record for net punt value in a season belongs to... the 2013 St. Louis Rams, whose punter was Johnny Hekker. That year, Hekker was worth 22.4 points over average. Justin Tucker's performance for the Baltimore Ravens may be even more impressive than what Hekker is doing. His only missed field goal all year was blocked by the Patriots two weeks ago, when Shea McClellin leaped over the Baltimore center. He's 33-of-34, including 10-of-10 from 50 yards or more. That comes out to 24.3 points more than the average placekicker would score in the same situations, adjusted for weather and altitude. Like Hekker, Tucker has more than twice as much value as any other kicker; Adam Vinatieri is second at 9.5 points over average. As an added bonus, Tucker has been worth 5.7 points over average on net kickoffs, which ranks fifth in the league. Right now, Tucker would be the best placekicker we've ever measured by a huge margin. The gap is bigger than the gap between second and tenth. Remember, our methods adjust the baseline each year as the average kicker becomes more and more accurate. The 2016 baselines are down from the 2015 baselines, but they higher than the baselines were 10 or 20 years ago. Tucker is not only better than everyone else, he's better when judged by a more difficult standard. Consider all the clutch field goals missed around the league this season, and then consider that Baltimore has five wins by less than a touchdown. Then consider the gap between Justin Tucker and every other player in the league at his position, and consider how much Tucker's performance depends on him alone compared to how much offensive and defensive players depend upon their teammates. He's a legitimate MVP candidate: not the guy who should win the award, but a guy who should be in the discussion of the top five or top ten. Once again this season, we have teamed up with EA Sports to bring Football Outsiders-branded player content to Madden 17 Ultimate Team. Each week, we'll be picking out a handful of players who starred in that week's games. Some of them will be well-known players who stood out in DVOA and DYAR. Others will be under-the-radar players who only stood out with advanced stats. We'll announce the players each Tuesday in the DVOA commentary article, and the players will be available in Madden Ultimate Team packs the following weekend, beginning at 11am Eastern on Friday. We will also tweet out images of these players from the @fboutsiders Twitter account on most Fridays. The best player of each week, the Football Outsiders Hero, will require you to collect a set of the other four Football Outsiders players that week, plus a certain number of Football Outsiders collectibles available in Madden Ultimate Team packs. QB Drew Brees, NO (FOOTBALL OUTSIDERS HERO): Led all Week 15 QB with 187 DYAR (37-of-48, 389 yards, 4 TD). K Chris Boswell, PIT: 6 field goals, including 5 of 40-plus yards despite below-freezing temperatures. LE David Irving, DAL: 2 sacks, 5 QB hits, 6 hurries, PD. LT Jake Matthews, ATL: No sacks allowed; Falcons RB had 11 carries for 66 yards and a TD to the left side. CB Logan Ryan, NE: Interception, led team with 7 combined tackles; allowed just 2 catches for 20 yards, but one was for 13 yards on third-and-15. All player/team DVOA stats pages are now updated through Week 15 of 2016. Playoff odds, snap counts, and the premium DVOA database are also fully updated. Drive stats and pace stats will be updated later this evening. If you're looking for more of my thoughts on the Football Outsiders playoff odds and DVOA ratings, you can also read my playoff odds commentary at ESPN Insider. OFFENSE and DEFENSE DVOA are adjusted to consider all fumbles, kept or lost, as equal value. SPECIAL TEAMS DVOA is adjusted for type of stadium (warm, cold, dome, Denver) and week of season. As always, positive numbers represent more points so DEFENSE is better when it is NEGATIVE. As always, positive numbers represent more points so DEFENSE is better when it is NEGATIVE. Looks like the BES and Weighted DVOA concur on the top two teams being the Patriots and Steelers. However the BES has the Pats No.1 and Steelers No. 2. Pittsburgh has to be scariest team in the league right now. Looking forward to their Week 16 clash with the Ravens! is clearly ranked because . is way better than this. But he was not complaining. Tucker has been insanely good this season, and with Dan Bailey missing two FGs the other day, Tucker now leads in all-time FG%. DVOA thinks the Bears are the 3rd best team in the division. This tickles me. Looks like second best. Minnesota is one spot back, and Detroit five behind, all the way down in 26th. The Lions, according to the playoffs odds, are 71% to make the playoffs, so we have the prospect of an near bottom five team making the postseason. Houston is now unlikely to make the playoffs, but we still have a decent chance of a bottom three team qualifying as well. Of course, the Texans are all the way up to 29th in weighted DVOA, so clearly they'll have that all important momentum in their favor heading into the playoffs. Who knows, maybe benching Brock Osweiler for another quarterback who also isn't very good is the secret formula to winning the Super Bowl. Mercifully, Minnesota's playoff chances are pretty much zero at this point. I don't think anyone would want to spend their precious time on Wild Card Weekend watching the display of O-line ineptitude that would have resulted from a playoff entry for the Vikes. I predicted, after Jake Long went down, that the Vikings offense would be ranked by DVOA 29th or lower by the end of the year. They are now down to 27th, so the goal is in sight. The defense now has their tackle rotation screwed up due to injury, and their interior run defense was their biggest issue to begin with. I was hoping they would draft a dt in the first round last spring, due to Floyd's chronic knee issues, and now Tom Johnson went on IR. I think they may have had their 16th different starter at the 5 o-line spots last Sunday. The injuries are the worst part of football. "I was hoping they would draft a dt in the first round last spring..." And instead, they drafted...a WR. One who, to this point, has all of 1 reception on 3 targets. I'm almost always on board with spending the first round picks on O-line or most defensive positions, unless there's a supremely talented RB, WR or QB available. Unfortunately, Spielman never answers when I call (damn caller ID!). It seemed to me that, once they invested what they did in free agency on the offensive line (an investment ruined by injuries), then trying to get the defense even better in the 1st round was a good way to go, and given Floyd's knee issues, a dt was a good option. I have no idea which dts were taken after Treadwell's spot, so my point may be baseless. I meant two write 2nd, which is what I found funny. 3rd would be more of whatever. "maybe benching Brock Osweiler for another quarterback who also isn't very good is the secret formula to winning the Super Bowl." Texans making the playoffs isn't as unlikely as all that. For one thing, if they beat Tennessee in Week 17 they're in, no ifs, no buts. DVOA thinks that would be a colossal upset, but I don't think the Texans are anything like as bad as DVOA does. They also get in if they beat the Bengals and the Titans lose to Jacksonville. Tennessee's comeback against KC was certainly a big deal for the AFC South race, but I still don't actually think the Titans are much better than 50/50. Yeah, I forgot about it, but I had looked up the betting odds earlier, and the oddsmakers have the Texans as small favorites to win the division. I agree that they probably aren't as bad as DVOA says they are. I've been wondering about DVOA's view of them all season. While I think they are plainly a bad team, third worst, behind teams like the 49ers, is hard to believe. I have a tough time seeing a one-win team being better than one with 8 wins. It's not like every one of Houston's losses were huge blowouts either. Yeah. Subjectively, I think they're... below average. Like, by eyeball, I would expect their DVOA to be between -5% and -10%, maybe. I think perhaps DVOA is confused by the fact that (not just this season) they can't compete at all with properly good teams (I think they could play the Patriots a hundred times and not win once) but very reliably beat mediocre and worse teams (except perhaps for mediocre teams with great quarterbacks). SRS has them in the approximate ballpark of the Dolphins, Colts and Panthers as a "true" 7 win team (over 16 games), which sounds about right, and significantly ahead of the Bears (who looked by far the weaker of the two when they played, for what that's worth). DVOA thinks they're more like a true 4 win team, which to be honest I think is fairly silly. Well, when they played the Chiefs, who are a good team, they didn't just compete but managed to beat them outright. I was using "properly good" in a fairly strong sense for which the Chiefs don't qualify. Substitute "elite" or something if you'd rather. I think that part of the reason our (the Texans') DVOA is so bad is that in our blowout losses, we didn't score many garbage time points. If you look at Jacksonville, clearly a worse team, they tend to get in some points after the game is out of hand, resulting in their matches appearing closer than they already are. DVOA is affected by this, but until some type of reliable method for discerning the difference between garbage points and true late game efforts is factored in, DVOA will have one serious flaw. Aaron has said that he found excluding garbage time doesn't make the numbers more accurate. When you start using correlations to an entire population, you make many assumptions - such as that the entire population is operating within the same rule/behavior set. These assumptions are generally not true, but they're close enough to work. It's important to remember that when you start looking at individual members of the population. It's entirely possible that Houston is changing their behavior when down multiple touchdowns, and their garbage time numbers are less meaningful than most (its also possible that DVOA is fine here). As an example here - we used to think that pitchers in baseball only had control of strikeouts and walks, and that batted ball outcomes were completely random - and the best correlations to future performance at the time came from just using these two outcomes. This was 'truth' for a very long time. Including hits/field outs made the year to year correlations worse. Then we figured out that infield flies are pretty predictable, and that pitchers actually induce them - and the correlations got a little better. Then we figured out that pitchers have a pretty consistent ratio of flyballs to groundballs, and that you can use probability distributions to figure out the expected outcomes of each type, and figure out the overall distribution. And the correlations got way better. Sometimes "it makes the correlation worse" means that we don't understand the data, or the data isn't being broken up correctly - not that the data isn't useful. Yes, and until we develop a better understanding, or break it up correctly, the data is more likely to obscure than illuminate. There may be some way to handle "garbage time" plays that provides more information. If Aaron finds it, with or without the help of somebody's suggestion, I'm sure he'll be happy to incorporate it. But just throwing all those plays out didn't help. For better or worse, this community isn't as robust as baseball's, so a Voros McCracken moment, or the subsequent corrections, is less likely. The effect of plays on DVOA is reduced in the fourth quarter if the lead is huge, like 22 points or more. So some of Blake Bortles being Blake Bortles does get accounted for. Since my Iggles are the ridiculous losers this year, can you show their game to game DVOA chart like you did for the Steelers and Giants? And can you show these charts for every team after, say, week 8 of the season? I feel like that one game vs. Pittsburgh has been inflating the Eagles' DVOA all season long. Except that the Pit-Phi game no longer counts for much, and the Eagles are still ranked 5th. Technically, Cleveland is the most balanced team in the league this year. Chicago and Miami get a shout out too, though. how is Miami NOT ? That's what I meant. Chicago and Miami are also very balanced. my point is the rankings show Miami is THE most balanced. Oh, I see. I guess I was thinking of variance too. Mia has its ups and downa. Cle is much more reliable. And if you go back to the '70s, you can include my personal favorite -- Horst Muhlmann. He reminds me of Hans Moleman from "The Simpsons". And let's not forget one of the early pioneers ... Jan Stenerud ... but also the Gogolaks and Garo Ypremian from before my time. My favorite kicker card of the era. It looks like Dempsey's head and hand are posing behind one of those cutouts you see at theme parks. Mic drop. Comment of the Year. Does variance actually mean standard deviation? Variance is the square of standard deviation (if I'm remembering correctly). Right, but I'm pretty sure BD103 is asking whether the quantity FO refers to as "variance" is in fact "standard deviation." Probably so, given that it wouldn't make much sense to express variance as a percentage. To be even more pedantic, what they write down is probably fractional standard deviation. In their defense, most readers are going to understand the what "variance" means, not so much for "standard deviation." And the raw number would be different if they wrote down what textbooks call variance, but the rankings would be the same. Using the charts at the top (PIT, NYG) and some crude data extraction, it is very unclear what variance is actually reporting. As I've noted in the past, numerous times, it's just the Excel VARIANCE function. I still think the Cowboys chances of winning the last game would be improved by starting Romo, but I acknowledge how difficult it would be to make the change. I agree. And I for a while I felt that the Cowboys should revert to Romo, until I remembered something I heard about Belichick (and have assumed to be true..). Someone (on here?) wrote that Belichick's decisions are largely driven by what's best for his team over a five-year horizon. And, if you use that lens to look at the Cowboys' situation, then you could never pull Prescott. You can drive a truck a mile wide through the gate labeled "largely". It's a very difficult conumdrum, without a clearly right answer. Okay, put it this way: Belichick will take decisions that hurts his chances of winning the Super Bowl in year N if it increases his team's overall chances of winning in years N+1-N+4. In Dallas' situation, I think that starting Prescott for the remainder of the season hurts their chances of winning the Super Bowl this year. However, it probably will increase their chances for all subsequent years (or at least from 2018 onwards). That it why some of Belichick's moves don't seem to make sense in the context of the current season. He seems willing to forgo some equity in this year's superbowl to improve the teams chances of being in the playoffs 2 or 3 years from now. Given the high variance nature of one and done playoff formats he knows that luck plays a huge part in winning a superbowl. You optimize your chances of winning it all by being in the playoffs a lot. I don't see how starting Prescott the rest of the year really affects the future years at all. Because Prescott gains experience. In particular, he gains playoff experience. I don't believe playoff experience is real thing, and I don't believe playing up to 5 more games will have any significant impact in any direction over the long run. You don't think the pressure and mentality of playing in a one and done vs a regular season game (where you have potentially 15 more to correct for 1 single error) is different? I've seen hundreds of players play just fine the first playoffs they're in. So I don't think Prescott playing in the playoffs this year will affect the Cowboy's chances in the next few years. 100s of those players don't have the ball in their hand and make key decision every single play. Brady, Warner, Rodgers, Brees, and plenty more were just fine. And some were not. Some notable QBs *appear* to have greater issues in the playoffs than in the regular season. It's an interesting subject because football is by nature a small sample size game, playoffs narrow that even further, and "first playoff appearances" is about as narrow as it gets. All of which tells me there's probably no effect, and it's all confirmation bias. That certainly has the greatest likelihood. And the way its going the NFL as we know it won't exist long enough (another 800 years or so) to get the amount data to be definite either way. In the meantime the colorful narrative reigns supreme. But do we actually need to just look at NFL data? I mean there are other sports where teams (or players) make playoffs or finals for the first time that would give insight to whether there is a general phenomena of struggling. I'd think there probably is a phenomena. But not so much a psychological phenomena of choking, but more down to the fact that players may be younger, less physically developed or even less developed in their skillsets. I agree. I don't think whether Prescott or Romo plays out the year affects the Cowboys' prospects in X+1 to X+4 at all. For all his obvious flaws McCarthy does get his teams to finish strong. Even when the roster is beat to hell the team puts up a fight more often than not. Five weeks ago you had NFL pundits and Packer fans declaring the Packers roster bereft of talent and that Thompson had clearly lost his way. Now Ty Montgomery is a revelation, Gunter is the number 1 corner, and Dix is in the Pro Bowl. On the flip side what in the hell has happened to Randall? And Rollins? Both looked solid at the end of last season but this season those two dbs have been at times completely humiliated by some really ordinary receivers. Randall I'm guessing (hoping) a big chunk of it is Davante Adams style "I'm playing, but I'm actually still quite hurt." He wasn't a good tackler in the first place, but since he has come back Randall has been consistently turning down contact. Very possible. What concerns me is that he looks to be trying to play as if he has catch up speed which isn't working. Curious how the falcons DVOA lowered after a blowout. Are the opponent adjustments at work here? If so, which teams drag it down so much as To nullify a blowout? Gb, NO, OAK, CAR won their games,while phi, den, ari, kc, tb and sd lost close games to good teams... is the rams losing to Seattle by 21 such a big deal in the opponent adjustment that it nullify a 41-13 blowout? Coming into the game, the 49ers defense was so bad that it was going to be very difficult for Atlanta to improve its already sky-high offensive DVOA. One would have fully expected Atlanta to dismantle the 49ers defense, and so they did. That seems fine to me. In the battle of two lousy units, looking at the box score it seems as though the Falcons defense and the 49ers offence played something close to a statistical draw. The fact that the Falcons generated only one fumble and zero interceptions (whilst fumbling twice themselves) also influences matters. The overall lesson is, if you want to improve DVOA, don't play the 49ers. That must be it, after Seattle blew out Carolina they dropped because some of their previous opponents had awful games that same week. But that's just it, I can find only one awful game in there (Rams), all the others were competitive and well with what DVOA would predict as likely. And regarding the point above, I would love to see the single game DVOA then, I'd be very surprised if averaging 8.3 yards per play can come out as a neutral game due to the competition. Atlanta's offensive DVOA went from 25.8 to 25.6 if the 9ers game counts as 1/14 of the score (it's a bit more because early games are discounted, but let's go with this for now), they would have 23% single game offensive DVOA. That's pretty far from neutral. Premium stats has the single game data. I don't reveal too much of it, but in the past what I'm posting here has been fine. They had an offensive DVOA of 30.5% in the SF game and have had 6 better performances and 7 worse performances so yeah, pretty much a median ATL offensive performance. Though it was their best passing DVOA performance of the year, the running DVOA was negative. I don't remember the discounting formula exactly but their 1st, 2nd, and 4th best offensive games came in the first 4 weeks. Not in that order and they did also have their worst, and only negative DVOA, offensive performance in the first 4 weeks as well. As those are all going to be discounted that's going to pull the offensive DVOA down and I think explains why your ballpark of 23% was off from the 30.5%. It almost certainly wouldn't come out as a neutral game per league averages, but it might only be a neutral game for Atlanta's offence in that situation. When the best offence in the league faces a bottom 3 defense, DVOA expects an annihilation. Put it this way - were you at all surprised that Matt Ryan torched the 49ers defense? Has it caused you to adjust your opinion of either unit? Cleveland is clearly ranked too high because they would lose to Bama. BCS rankings are way better than this. Role Tyde! As Aaron points out, Weighted DVOA makes recent games more important than earlier games. Does this weighting make sense for games involving division rivals since you play them twice? For example, the Steelers played the Bengals in week 2, then again in week 15. I would think a prior head to head matchup would be the best prediction of the future matchup (with adjustments for injuries, home vs. away, stadium type, etc.) for playoff odds. DVOA is billed as a descriptive metric rather than predictive. In some scenarios a week two meeting might be a good barometer but it could easily have little to know bearing on the direction the two teams took in a given year following that meeting. "DVOA is billed as a descriptive metric rather than predictive." No, it is a little bit of both. That's why it goes out of its way to add context to things that aren't meaningfully predictive, like devaluing longer plays and disproportionate fumble recoveries.